Nationality: Brazilian. Born: Maria do Carmo Miranda da Cunha in Libson, Portugal, 9 February 1909; grew up in Rio de Janeiro. Career: Radio singer and recording star in Brazil from late 1920s; 1939—debut on Broadway in The Streets of Paris ; also appeared at the Waldorf-Astoria; 1940—U.S. film debut in Down Argentine Way as featured act; also appeared on television. Died: Of heart attack, in Beverly Hills, California, 5 August 1955. Parish, James Robert, The Fox Girls , New York, 1971. Cardoso, Abel Jr., Carmen Miranda, a cantora do Brasil , Sao Paulo, 1978. Saia, Luiz Henrique, Carmen Miranda , Sao Paolo, 1984. Barsante, Cassio Emmanuel, Carmen Miranda , Rio de Janeiro, 1985. Gil-Montero, Martha, Brazilian Bombshell: The Biography of Carmen Miranda , New York, 1989. Obituary, in New York Times , 6 August 1955. Konder, Rodolfo, "The Carmen Miranda Museum: Brazilian Bomb-shell Still Box Office in Rio," in Americas , September 1982. Roberts, S., "'The Lady in the Tutti-frutti Hat,': Carmen Miranda, a Spectacle of Ethnicity," in Cinema Journal (Austin), Spring 1993. Terrell, Nena, "Helena Soldberg Unmasks a Brazilian Idol," in Americas , January-February 1996. Osthoff, S., "Orson Welles in Brazil and Carmen Miranda in Hollywood," in Blimp (Graz), Spring 1996. Carmen Miranda: Bananas Is My Business , documentary, directed by Helena Soldberg, 1994. 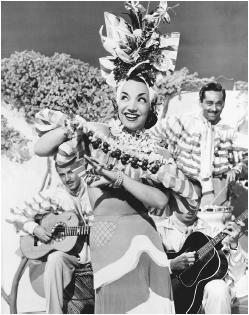 Carmen Miranda's phenomenal but limited success in Hollywood seems closely linked to the United States's Good Neighbor Policy during World War II and Twentieth Century-Fox's skill at showcasing musical talent. The Good Neighbor Policy encouraged economic, cultural, and military alliance between the United States and Central and South America. Within this political climate, Miranda would fulfill the role of musical "ambassador" between Latin America and the United States, giving American audiences a taste of Brazilian culture. This "taste" however, as nurtured by Fox, proved narrow, highly stereotyped, and offensive to Brazilian audiences. The most popular singer in Brazil during the 1930s, Miranda recorded more than 100 records, appeared in five films, and conducted nine sold-out South American tours. These credentials brought her to New York City in 1939 to appear in The Streets of Paris . Her stereotyping as a Brazilian "bimbo" began with her first American interview. Hoping to impress with her sparse English she exclaimed, "I say money, money, money and I say hot dog! I say yes, no, and I say money, money, money. . . ." When asked why she learned to say money, Miranda answered, through an interpreter, that everyone who comes to the United States must learn to say money. Financially insightful, but probably not the best first impression to make. Nevertheless, after her six-minute performance garnered unanimous rave reviews, she became the toast of the town. Her costumes set a fashion trend and the samba dominated New York City dance floors. Her return to Brazil after the show closed proved significantly less triumphant. Held responsible for "Americanizing" and betraying Brazilian culture, Miranda's popularity plummeted. A cruel response from her own people to her Broadway success, but one that became prophetic. When she signed an exclusive contract with Twentieth Century-Fox, she remained essentially a "novelty act" perpetuating her star image as the "Brazilian Bombshell" in film after film. From Down Argentine Way to Scared Stiff , Miranda was carefully placed as a well-known and tempestuous Latin performer who spoke broken English (her first three films were set in Argentina, Brazil, and Cuba to legitimize her accent) and sang in Portuguese. Her frenetic and incessant gesturing, whether performing or not, suggested a human whirligig. Her clothing copied her Broadway costumes which she brought from South America: Brazilian native dress modeled on the "bahiana," the African vendors of Bahia, Brazil. Their clothing features many layers of brightly colored and differently textured fabric topped with glittering jewelry and flower/fruit hats. Twentieth Century-Fox modified and exaggerated this folk dress until her exotic millinery became her trademark. Busby Berkeley created the ultimate image of Miranda when he made her "The Lady in the Tutti-Frutti Hat," in The Gang's All Here . Standing under a forced-perspective set painting that suggested an impossibly gigantic banana hat, Miranda became the stereotyped embodiment of Brazil her people feared. Even when top-billed, Miranda was never cast as the romantic lead, her non-American mannerisms and sexuality being "unsuitable" for the hero. Miranda's volatile nature juxtaposed the introverted demeanor (hence cultural "acceptability") of the romantic female leads with whom she was often paired: Alice Faye and Vivian Blaine. The only time she was cast as the romantic lead, in Copacabana , she played a dual role that demonstrated her typical position, fluctuating between her usual "Brazilian" performing style and a refined French chanteuse. Remarkably, given the near caricature of her persona, Miranda became a major musical star and the highest-paid female performer in the United States during World War II. Even though she made only 14 Hollywood films, Miranda's star image is still readily recognized in the United States today. She has been parodied by everyone including Mickey Rooney in Babes on Broadway , Bugs Bunny, Milton Berle, and a number of Gary Larson cartoons. That she should be best remembered for her hats undercuts her talent. Her Brazilian legacy as one of that country's most popular performers provides a more fitting epithet.